Delhi-Srinagar-Leh Road Trip is a dream trip for any road tripper in India, and probably the world. 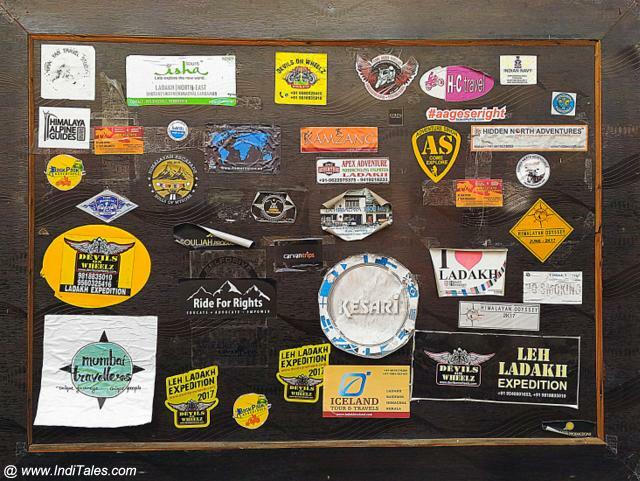 Add to this the Leh-Manali circuit and this is what the dreams are made of. These roads pass through the most scenic routes that you can travel on. The vistas change from rich green fields of plains of Punjab to river fed meadows of Kashmir before all the green is lost and naked Cost to the cold desert of Ladakh presents its hues in various shades of stones. The roadside Dhabas make way for the roadside monasteries. I was on this dream trip organized by Oyo Rooms in association with ScoutMyTrip team for the highest blogger meet at Khardung La in Ladakh. I could not complete the trip due to bad health and had to return back from Leh. This means half a dream lived and another half parked for some future date. As soon as I landed in Delhi, I saw the Kanwariyas on the roadside. I realized the month of Shravan – the typical monsoon month of Indian Calendar has just begun. So this was going to be a monsoon road trip as well after the Konkan Coast Road Trip last year. Getting out of Delhi was the biggest challenge we faced on this day. When you travel, make sure everyone in your car or group agree on which way to exit Delhi, else the metropolis has a way to eat up all your time and energy. Once out of Delhi, you can stop anywhere on the highway when hunger pangs visit you. Frequent road trippers will tell you to stop at famous Dhabas at Murthal. My verdict – Skip anything that is suggested. Stop at the small Dhabas where the truck drivers eat. Do not worry about the hygiene part – no one needs a better stomach than truck drivers. We passed by the city of Panipat and wondered if this is where all those battles were fought. All I could see there were boards selling Panchranga Achaar along with many types of digestive Golis. Chai stop at Ambala was a desire that never came true. As we crossed Sutlej, I knew I was close to my birthplace. We had all intentions to stop and take a picture but the cruel flyover made the town look so distant. It was like flying over it, rather than passing by it. The same was true for cities of Ludhiana, Jalandhar, Phagwara till our hungry stomachs made us stop at a roadside Dhaba. The food was good but what I enjoyed most was speaking in Punjabi after a long time & discovering others in the group who can speak Punjabi. To speak Punjabi in Punjab is like really re-visiting the place. Tummies full, we started moving towards Jammu – this is when we crossed Beas and Ravi rivers. Sutlej, Beas, Ravi, Chenab & Jhelum are the rivers that give Punjab its name. I knew by the time we reach Srinagar, we would cross all 5 of them. So, is the drive from Ambala to Srinagar really the drive through the larger Punjab as it used to be. On the way, we had a nostalgic taste of sand roasted corn or Chhali, Murunda or the puffed rice cake and freshly plucked Jamuns. By the time we reached Jammu, it was dark and we would leave the city before the sun comes up the next morning. Thankfully, I could meet an old friend in Jammu and I promised the city that I would come back to explore it at leisure. We started early from Jammu so that we can reach Sonamarg in time. Rains and the recent attack on Amarnath Yatris on this route made us a bit anxious for this part of the journey. I was looking forward to crossing the famous tunnels on this Jammu-Srinagar route. Especially, the newly opened Chenani-Nashri or the Patnitop Tunnel which is the longest tunnel in the world at 9.28 Km. This tunnel connects Chenani in Udhampur district to Nashri in Ramban district. Just short of Udhampur, we stopped for roadside Parathas. Deep fried with butter floating on them – they sound sinful but believe me there is nothing more heavenly than them. We crossed the Chenani-Nashri tunnel holding our cameras for all its length. We were in Ramban, traveling along the muddy Chenab river. Little did we know, this is where would end up spending a night as the road was closed due to a landslide. Ramban residency – an ordinary looking hotel had a lovely view of the Chenab as it takes a turn around a hill. I enjoyed a small walk along the river, clicking some images and soaking in the air of Ramban. Next day very early morning we set out to conquer the road. Our target for the day had moved from Sonamarg to Kargil. It was going to be a long day. We passed by cricket bat making units on either side of the road after Banihal. The vistas were enchanting, but we had no time to stop. We did stop at the Titanic viewpoint of Anantnag to admire its sprawling vistas. For the springs it boasts of, I will have to make another journey. Srinagar city had tense air, with not many places open and not many people out there. We stopped by the Dal Lake for few minutes but it was devoid of tourists. A few Shikaras floated in the waters making it look melancholic. From Srinagar, we headed towards the Ganderbal district. This is the district where popular hill station Sonamarg is situated. Drive to Sonamarg was the most scenic part of the trip. Sind River – a major tributary of Jhelum river was flowing towards Srinagar while we moved away from it. Glaciers started making an appearance on the horizon. To watch the glacier slowly melting and merging with the river makes you think of the constant journey of water. A Hut like a formation of glaciers releasing water in drops is intriguing. This is how glaciers move – by losing a bit of themselves every moment. Outside the restaurant where we had food, vast green meadows were dotted with the horses – waiting for tourists just like their owners. Some of them tried to tell us ‘Kashmir is Safe, Come here without any fear. We will show you our beautiful land.’. Their words had fear and assurance in equal measures. How we both wish the words are true. A little after Sonamarg, we stopped to look at the huge camp on the bend of Sind River. Colorful tents neatly arranged in rows look like lego blocks from a distance. Choppers flew back and forth porting Yatris who can afford them. I stood there trying to grasp the magnitude of Yatra. I recalled all the Bhandaras I have seen right from Jammu on the National Highway 44 and then a lot more after Banihal. Even the number of Bhandara tents could not prepare me for this large number of Yatris at the camp. Given the weather and political conditions – this was sheer faith in action. Even today when I think of that scene in front of me – I find it surreal. In my mind, Amarnath Yatra was always in some distant land. Standing there, I felt I am so close to it & yet so far. A part of me wanted to join the Yatra there and then and see the Shiva-linga that comes only during the Shravan month of Hindu Calendar. I said a silent prayer before we left Sonamarg area and headed towards Zoji La Pass. Zoji La Pass is one of the highest mountain passes in the world. The pass would remain in my memory as a dull gray muddy path with glaciers in matching colors all around. We passed through the walls of glaciers but because of all the dirt on them, they just merged with the rest of the landscape. At one place, where we stopped, Sledging was being offered to tourists. We had a tea as the wind tried to scare us with its velocity and chill. Suddenly, I was feeling cold. The air became thin and this was the beginning of the end of my Delhi-Srinagar-Leh Road trip. Highly Recommended – A Night Halt at Sonamarg before you climb the mighty Zoji La Pass. After getting down the pass, we started moving towards Kargil that was our night halt. On the way, we stopped at the Drass War Memorial near Tiger Hills. Kargil on the banks of Drass River turned out to be a much bigger town than I had imagined. At the hotel I saw boards announcing 40 things to do in Kargil – almost felt like I can use it for the blog. This is a bikers favorite route so the boards were full of stickers of biking groups. Barring Leh, Kargil was the only place where I saw tourism being promoted actively. I think it would be worth spending a few days here and exploring the region. It was a sunny day. After absorbing the Kargil town and Drass River we started driving towards Leh. The roads twisted and turned. With every turn, a new vista opened up. The green gave way to subtle yet bright colors of stones. At places green was trying its best to sprout out of stone hills – most places it failed. This was our first photo stop. It is a small lovely monastery standing on a cliff like a rock. What makes it interesting is the Maitrayee Buddha or the future Buddha carved on one rock face. The temple around it is a recent development. This ancient sculpture gives this road an old-world charm as you know travelers have walked on it since ages. The monastery had the usual colorful interiors with painted walls. What I found interesting was the list of donors on the outer walls written in simple black & white. Prayer flags gave color to the monotone of Ladakh. We stopped at these two mountain passes – more like a photo stop. I was feeling sick by now, so stayed inside the vehicle. All I remember is the strong wind that made everything flutter. After this, we passed by Lamayuru and the confluence of Zanskar & Indus River. I had seen this route when I did Ladakh in Winters. This time I more or less slept through the route. The bright blue color of Zanskar River was what I wanted to stay with instead of the muddy river of monsoons. Leh, that was an island of tranquillity in January was like a fish market in July with traffic jams and so many people that for a moment it felt I am back in Delhi. Leh was supposed to be our mid-way stop after Delhi-Srinagar-Leh Road Trip. Next part of the road trip would take us to Khardung La, Nubra Valley, lakes of Ladakh and return via Manali. I had to return back from Leh. I hope there would be another time when Ladakh would call me back for another road trip. But I am happy that I could do Delhi-Srinagar-Leh Road Trip. There is a small window in summers when you can do this trip and that too when the political situation allows you to. In that sense, the trip was a success. This trip was a part of #highestbloggermeet organized by OyoRooms and ScoutMyTrip with a motto #aageseright. Do check out the #Oyonauts program launched for all the travelers and storytellers. Thank you guys, for making this trip happen and for your kindness. Wish you all a life full of wonderful road trips. बहुत भाग्यशाली हैं आप संदीप जी, आशा करते हैं की आप आगे भी ख़ूबसूरत सड़कों का आनंद उठाते रहें. As I read through this account, nostalgia pangs nudged me hard! The taste of chhalli, murunda and jamuns was back in my mouth! BTW, for me also, this was a half-lived dream! Ditto, Neha. Such a pleasure to meet you, let’s hope there would be another trip together. This post brought back those good memories of the butter dripping parathas and the jamuns we had in Jammu. Even I thought about the 40 things to do in Kargil post. Great account Anuradha ji. Hope you get to complete the circuit all the way to Manali sometime. Johann, way back in 2004 when I started writing this travel blog, all I wanted to do was document these small joys of travel like eating Jamun. I am sure there would be another time to do the rest of the journey & I hope there would be another journey together with all you young bloggers. So glad that you enjoyed the post, Gordon. You were bang on about the paranthas. To be honest, Sukh Dev was supposed to be a loo break while we ate at Gulshan. But with a convoy of 5 vehicles, plans change on the fly:) The paranthas could have been much better! The second halt we made that day for lunch was a good call. Such simple but delicious food. Something about the food up north, which never ceases to amaze. When on long drives, I usually make it a point to find dhabhas which have a lot of trucks parked around. Truckers love their food, and usually halt where there is running water because they also need to freshen up and bathe the next day. We’ve done it a few times with the truckers and they’re actually pretty affable blokes. When traveling with Swati, I also look out for dhabhas run by Sardarji’s. They’re the best hosts especially if you’re with a lady. Real gentlemen. But we really missed you on the onward journey Anuradha. You would have really enjoyed the views from there on. While health is one, Ladakh is going to be there. You can always do this the next year or after. But do it on a road trip. There is no better way to soak in the mountain air and just be. Hope to see you soon on our next mountain trail. Yes Vineet, looking forward to the next road trip. This time the exploratory road trip, where you explore a trail and discover new things. I like this article. thanks for sharing wonderful and nice travel blog. Satveer, am also waiting for the next road trip. Oh wow, beautiful country. Looks like a good time! Yes, Ryan, Indian is a beautiful country and its always good to travel across India. Great looking scenery, but I have never been to any of these places before. My wife has been to Delhi; so it’s something to consider. Thank you for sharing. Kashmir is beautiful – it is like nature putting its best foot forward. It is one of those destinations that you must visit in your lifetime. I’ve never even heard of this country but from your pictures it sure looks amazing! This is India. I am sure you have heard of India before. If not, it’s time to plan a trip to India. If I were to ever visit India, I would definitely have to travel with someone who knows the lay of the land. It’s such a vast country! The views and culture are epic. I hope to be able to visit one day. Ola, do let me know when you visit India – would be able to help you with most of the things in India. I hope you get to come here soon enough. Anuradha, wonderful post, took me to another world. Really want to go there in person now….. Thanks, Jagpreet. You must travel on this road – it is both ancient and significant from current day perspective. It does sound like such an amazing trip. I love all of the different pictures of India you have here. I really love the picture of the pass. David, that is a very difficult pass to drive by. I am glad I did it – it has been on my list for a long time. I’ve never been to India but I love the food! So many incredible destinations. Isabelle – you are so right. You can spend a lifetime and still just scrape the surface of what India has to offer. Even in food, it is a riot, you have to come here to experience that. This road trip list is awesome! I’m possibly heading to India in November and would love the chance to take one of these road trips. Danasia, do get in touch with me when you plan your road trip or try ScoutMyTrip – a road trip company that helps you plan road trips across India. In fact this road trip was done with them. Just be well prepared when you plan Leh trip. Panipat is something that our history books never let us forget. Wonder how it was for you to study about battles of Panipat living in Panipat. I meant Panipat. In my above comment spell check made it Panipuri. ???? Debajit – I have been to Assam, Meghalaya & Arunachal – and you are right – NE is breathtakingly beautiful. I hope to revisit soon and cover the rest of the states as well. Your road trip sounds absolutely surreal! Your pictures speak for itself how beautiful it was! Ana, this is one dream road trip to undertake. Amazingly expressed in words . The taste of words cannot be matched with anything. I have seen 100 s of video on Leh Ladakh trip , but in words it’s much more exciting to read . It makes u feels like u himself is having that experience. ???? Leh is one of my favorite destination… I have been to Leh several times. Every time you will find new and beautiful environment their.. Even after 2 km, the environment changes there. Love this place. Thanks for the blog. Ladakh is my all time favorite destination. Thanks for this adventurous travelogue. Mayuri – some destinations are like that. I have a long list of places that refuse to get out of my wish list. Give them time, they eventually happen though. Nice Post! I love traveling & this is very enjoyable also with family & friends.